The Slingbox™ SOLO allows you to watch and control your favourite TV source—including HD programmes—from anywhere in the world via your laptop or mobile phone. You can choose to watch your cable, your satellite receiver, DVR, or even your DVD player. With the Slingbox SOLO, you can watch your favourite TV programmes and sporting events wherever you are. Connects to any of your high definition devices. 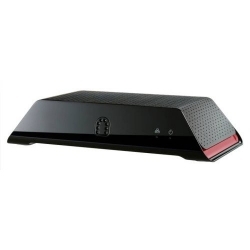 Connects one high definition or standard definition device, such as your digital cable set top box or satellite receiver. SlingPlayer™ is the software that works hand-in-hand with the hardware inside the Slingbox to bring your entire living room TV viewing experience to your laptop, desktop or mobile device.